Semerak pledges to clear Ukraine from garbage the way Rada was cleared from communists. 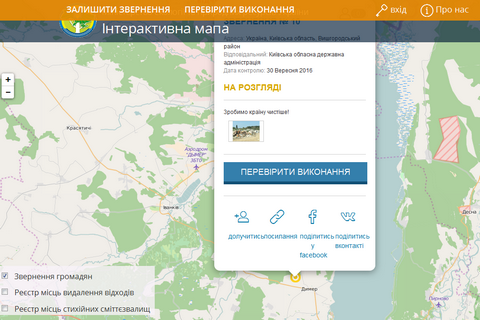 The Ministry of Ecology and Natural Resources on September 8 announced the launch of an interactive map of landfills at ecomapa.gov.ua. Speaking at a Cabinet meeting on Thursday, Environment Minister Ostap Semerak said that the number of landfills, both permanent and unauthorized, is estimated 30,000. Meanwhile, the ministry is aware only of the location of 2600 dumps, so the new web service will be aimed at gathering information about the unauthorized garbage dumps. "Every citizen may visit the Ekomapa page and post a message about a dump. The information will be processed and conveyed to the Ministry of Environment and local authorities," the minister said. The ministry has also had a mobile app developed for the map, which runs on both Android, and on iOS. Poltorak said he was confident that the new service will help resolve the problem of unauthorised dumps in Ukraine the way the parliament was cleared of the Communist Party.